A few days ago, I wanted to hike somewhere I had never been before. 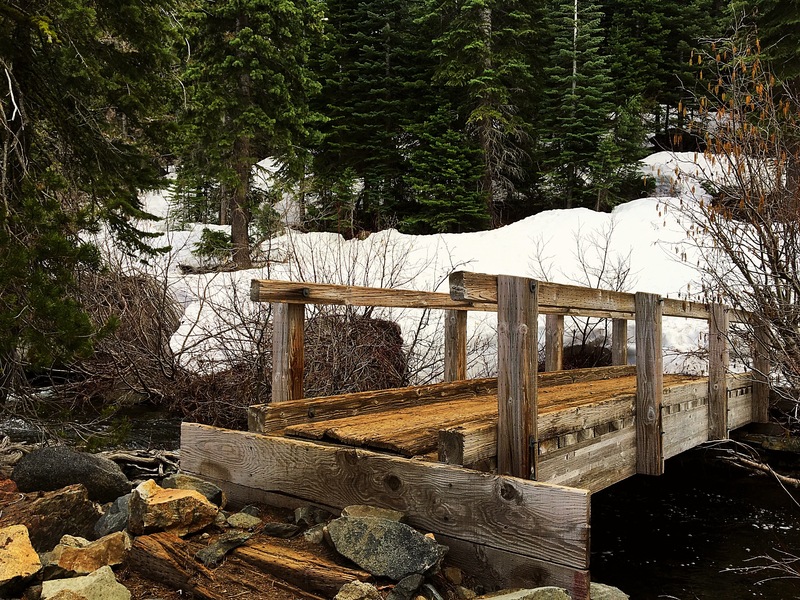 I chose the Loch Leven Trail in the Tahoe National Forest because of the picturesque lakes, waterfalls, and railroad crossing I saw online. On the drive up I eagerly anticipated the new adventure. As soon as I arrived, however, the unfamiliar terrain made me uneasy. Eventually, I found the trail marker — an old, weather-worn, small, wooden sign nailed to a tree. It was so inconspicuous, I was surprised I saw it. Stepping onto the trail, it took me several minutes to orient myself. I walked along boulders, often intuitively choosing the direction; many times the trail split into deer paths. I felt a growing nervousness. It would be better to do this hike with a friend. I thought of going back. But no! My glamsient life is not about limitations! It’s about freedom and adventure! Instead of turning around, I built cairns to mark my route. As I hiked, loneliness settled deeply into my heart. With a friend, building cairns would be fun, we would laugh when they fell and see who could build a better tower; we wouldn’t be scared because we would have each other. By myself, it was a response to real fear — getting lost in the wilderness, alone. The loneliness grew: it wasn’t just this hike, it was a continuation of loneliness I experienced since I began my glamsient journey a year ago, as if it picked up where the previous lonely day had left off, compounded by the ones before that. Keeping to my mindfulness practice, I stopped and encountered the loneliness. The pain diminished under the light of awareness, and once it did, I meditated on feelings of love — the eternal wellspring of love. Despite my efforts, however, the loneliness kept returning. I knew following sadness into despair was not the way; it is a pattern in my past, and I am leaving that behind. But when would the loneliness stop, so I could just enjoy myself? I may have been climbing a mountain, but I was climbing on the inside as well. I was fighting between who I have been and who I want to be. And every internal step began to feel more and more tired. I kept going; trying to remain present; building cairns; listening to trickling streams caress the trail, sliding down rock faces that once housed glaciers; watching tiny waterfalls cascade over tree branches; hearing the small sound of a grey frog bellyflopping into a puddle when I startled him. Turning a corner, I came upon a snow patch! I was elated to see snow this close to summer, but then I was overcome with loneliness because I didn’t have a friend with me to share my joy. What was wrong with me? Why couldn’t I be happy just to see it by myself? In all this pain and conflict, I had to sit on a rock to center myself. When I did, tears came to my eyes, and I let myself cry. I stayed present with my sadness; it was joined by doubt. In my glamsient life, wasn’t I walking a new and unfamiliar path? I had chosen to become a glamsient to fulfill a deep need to self-actualize artistically, and it had since grown into a journey of deeper consciousness and spirituality. But if I was so lonely on this new life path that I couldn’t enjoy the trail under my feet and the unfolding adventure, what was the point? Suddenly, the path I had chosen a year ago didn’t make sense. Suddenly, even though it had seemed right at the time, I felt like I should have never left my easy, comfortable, former life. I had a nice home and a large group of good friends. I hadn’t been deeply satisfied, it lacked substance and felt restrictive, but at least I never felt like this! Why would I ever leave that easy life behind? Certainly, the past year of glamsient living gave me moments of unparalleled joy and, although I have a lot of work to do, I have grown as an artist — producing more and better work than before. Taking the time to dive into my spirituality has created greater meaning and presence in my life. Moving towards greater consciousness has helped me become aware of and break habitual attachments and patterns. But couldn’t I have done all this, couldn’t I have made the same artistic and spiritual gains, and still kept my familiar home and nearby friends? Wasn’t this new path counterproductive if I felt so miserable and conflicted in this present moment? I looked out past the trees to see billowing clouds above the snow-capped mountains articulated by jagged points and crags. For no reason in particular, I turned to look behind me. There I saw a small pine tree with a curved trunk growing out of a rock! I laughed through my tears. I have long identified with trees growing out of rocks; my spirit seems to me like it springs from a hard and lifeless place and it is only through the sheer power and persistence of the Creator that my soul survives and thrives. I even have a tattoo on my leg of a tree with a bend in its trunk — just like the tree I saw before me. Hearing this message with the ears of my heart, I felt a sense of comfort and strength wash over me. Without leaving my former life, I would not have gotten to this very moment on this rock to encounter the Spirit that tore through my sadness with Truth. Without leaving my former life, I could not embark upon this new journey that is filled with inspiration, expansion, meaning, and authenticity. With renewed support, I closed my eyes and allowed the air to dry my tears. I saw myself scoop the dark and painful emotions from my heart and surrender them to the Divine. In the open space a love, whole and gentle, spread outward with a vibration so complete that it softened the edges of my being. I stood up, and with faith in myself and my journey, continued hiking the unfamiliar path. On my way down the mountain, I passed several cairns I had made. One even helped me when I couldn’t find the trail. When I saw the parking lot, it seemed I completed an incredible journey, not just a couple miles. Getting into my car, a half-grown pup ran over to me, smiling and wagging it’s tail. His owner, wearing all khaki including a floppy hat with the chin strap pulled tight, approached us. “Finishing up?” He asked. Beautiful descriptions, Chelsea. When you cry, I cry. Saw your Loch Leven post on Instagram, which led me to your blog. You’re a very compelling writer. With all the snow on the upper trail, I got fairly “detoured” myself and considered the dangers of being alone(injury, fatigue, etc). One definitely has to center and breath in those moments. I liked how you mentioned surrending to emotions and eternal Creator who has given us creativity and a sound mind to search for the right path. Also, borrowed a friend’s golden retriever(rent-a-dog) with a curious attitude and insane couch to mountain agility. That was motivating. Thank you for reading and taking the time to write me a response! I greatly appreciate your feedback. It’s wonderful to read the parallels we encountered on the Loch Leven trail. I will keep writing; thank you for your encouragement! It means a lot.